Application: Marine Corps Base Camp Pendleton is the major West Coast base of the United States Marine Corps. It is located on the Southern California coast, in San Diego County. The Camp maintains a self-sustaining water supply and sewage treatment plant to serve a population of 70,000. Problem: Camp Pendleton has been using four diaphragm metering pumps to inject sodium hypochlorite into their finished potable water to pre- and post-chlorinate the drinking water for the base. The diaphragm pumping cycle consists of a suction and discharge phase. During the suction phase of the cycle, gaseous chemicals like sodium hypochlorite can cause vapor lock and the pump may lose prime. Priming was a challenge for the diaphragm metering pumps because this application required intermittent pumping through duty and standby metering pumps. Another problem that presented itself with the existing diaphragm pumps that were being used was the money and time spent of doing repairs. The repair kit is costly (averaging around $1,200 per kit), the pump takes a full day to repair, and the repair is complicated and messy. 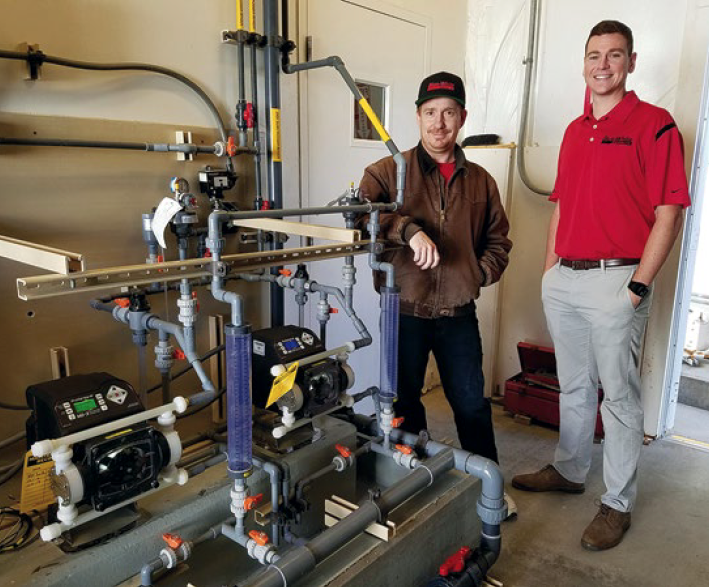 The pumps were installed on Oct. 27, 2016, and according to Keith Regalado, Camp Pendleton’s shift operator, “The pumps have worked perfectly since the installation and are accurate and consistent.” They have been running continuously and there has been no maintenance needed. Learn more about Blue-White ProSeries-M products at www.proseries-m.com.